Wee Lil' Blog: Repost: Why Line Dry? 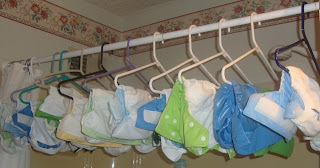 When I first started looking at cloth diapering, I remember reading a lot about line drying your diapers. But other than saving a few bucks on the energy bill, I couldn't figure out why anyone would want to take that much time to dry a diaper. So I looked into it and I have to say that today, I line dry all my pocket shells and often hang the inserts and pail liners out as well. Keep reading and I'll tell you why! 1. Many manufacturers recommend it. When I first used bumGenius, I remember reading in their wash instructions that you could put their diapers through the dryer on medium with no issues. Later, they changed their recommendations to "line-dry covers and diaper shells. Tumble dry inserts, fitteds and prefolds" (bumGenius- http://www.bumgenius.com/help.php). Line drying actually saves your diapers and gives them a slightly longer life. This is especially true for the aplix on diapers. The less the aplix goes through the dryer, the longer it lasts. 2. The sun helps remove stubborn stains. I talked about this one in more detail yesterday, but again, the sun helps bleach out stains. It's especially effective on EBF poop. 3. The fresh air helps clear out stubborn diaper stink. After several dries in my dryer, my inserts often smell funky. One easy cure for that is to hang them outside. They smell great after a few hours in the fresh air! 4. It saves you money. It's no surprise to anyone that running the dryer costs you money. 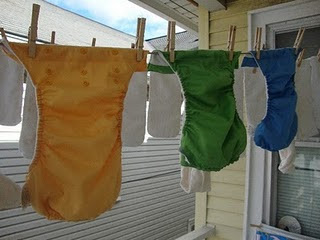 Even hanging just your diaper load saves you the money from running the dryer that one time. And since we all wash diapers regularly, that adds up to a lot by the end of the diapering days. I always line dry unless it's raining. Even on a completely cloudy day the really bad newborn stains came out COMPLETELY! So just because the sun is not "out" it doesn't mean you won't get the same benefits! Thanks for sharing Chari! :) I actually had this originally posted in winter, which is part of the reason for the "sun is out" comment. I also didn't want to suggest hanging them in the rain or anything. Lol.